An after work dinner date with the girls makes for a fun mid-week treat but it often presents a familiar dilemma – where will we eat? Last month an importune get-together was hastily arranged and there was no such dilemma as we all suggested Stix and Stones, a steak and seafood restaurant on Belfast’s Upper Queen Street. I had heard good reports about Stix and Stones where steaks are cooked on a hot stone and really wanted to sample this style of cooking. Considering it was Tuesday we had pre-decided it should be a main course only affair, but then the waiter presented us the a la carte and pre-theatre menus and with two courses for £14.95 it would have been rude not to pretend one was going to the theatre. As we perused the menu the friendly waiter helped us select a bottle of wine, the Stoneburn Sauvignon Blanc (Marlborough, New Zealand) priced at £22.99 and told us about the daily specials. For starter I chose the whipped goats cheese and filo pastry served with pickled pears, quince jam and candied walnuts. The ultra-thin and crisp filo pastry perfectly complemented the creamy cheese and sweet toasted walnuts making the starter surprisingly light. The other two girls selected the teriyaki chicken wings served with creme fraiche salsa and cucumber salad. The wings were described as both tangy and sweet and the remaining bare bones confirmed they must have been good. For main I selected the eight ounce Rump Beef served on the stone and accompanied with little portions of a mushroom and truffle ragu, beetroot relish, whiskey pepper sauce, tomato and a side portion of hand cut chips with truffle mayonnaise. All steaks cooked on the hot stone are served rare. Medium is my preferred choice but I decided to go with the flow, after all sticks and stones may break my bones but a piece of rare beef surely would not hurt me. The steak sizzled as it arrived and although it was quite rare for my liking, a few seconds longer on the hot stone and it was cooked to my standard of perfection and the element of personalised searing was very satisfying. The beef melted in my mouth and was well worth the extra £2 charge. It was so good I almost neglected the other elements of the dish; a hint of whiskey gave the pepper sauce a real kick and the truffle ragu had a rich depth that matched the steak. The chips were chunky, crisp and well-cooked and served with a dollop of truffle mayonnaise which I found slightly overpowering – purely a matter of personal preference though. The other two mains ordered were battered salmon and cod served with watercress, caper and lemon mayonnaise and wild mushroom fettuccine pasta with a truffle creme fraiche sauce, spinach and parmesan. I was informed the fish encased in a crisp batter was lovely and moist and I personally had to sample the pasta dish as it was my own second choice. The sauce was both smooth and rich with the strong woody flavour of mushroom. After dinner we decided to ‘just look’ at the dessert menu and with much still to talk about it made sense to share dessert(s) , at £17.95 for three courses it wasn’t going to break the bank. The girls reluctantly preparing for dessert. The chocolate and hazelnut brownie was crisp on the outside and moist in the middle. Served with vanilla ice cream and an almost bitter blood orange foam this contrasted well with the sweetness of the chocolate and vanilla. A Caramel Panna Cotta was selected as dessert number two; served with homemade spiced bread and banana sorbet the panna cotta was sweet and silky smooth and was my favourite part of this dessert. 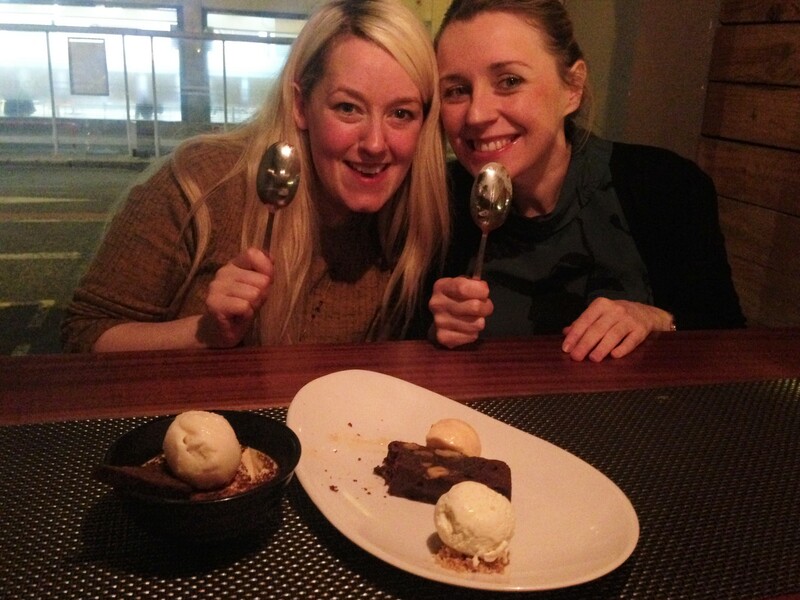 The owners of Stix and Stones have brought a unique dining experience to Belfast and considering there were many dishes on the varied menus that caught my eye, the restaurant could become a regular venue for ‘ladies who dine after work’. This entry was posted in Restaurant Reviews and tagged Belfast, chocolate brownie, hot stones, panacotta, peppered sauce, restaurants, steak, stix and stones by Michelle Loughran. Bookmark the permalink.